The Salafi political movement experienced massive transition in the past two weeks, enduring splits, recriminations, and leadership changes. Having long foresworn the political process, it is right and natural for growing pains to characterize their apparent embrace of democracy. Taking stock, three observations describe their current standing. The process is transparent, but is the result foreordained? The rhetoric is clear, but are they learning spin? The inspiration is worrisome, but does it determine? The main question directed to Islamist politicians is if they truly believe in democracy or simply use it as a ladder to power. Egypt’s constitution declared its governing system to be both democratic and of an undefined shura (consultation). The shura provision was added at the request of Salafis, whose ideas of democracy issue from the selection process of the early Islamic caliphs, which was consensual. 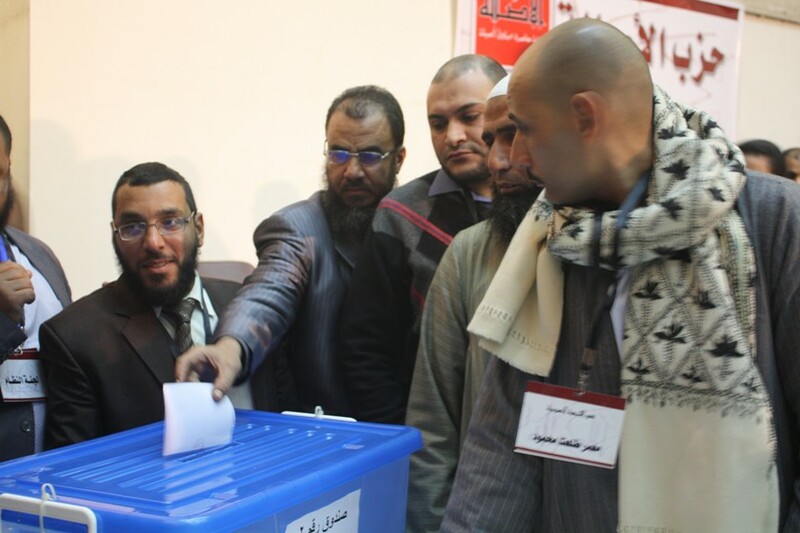 If internal elections are any indication, Salafis are willing to be transparent about their leadership choices, but greatly prefer the predetermined aspects of shura. There are reasonable reasons to reject quotas as well as to trust sharia provisions toward non-Muslims. Yet probing beyond the headlines exposes differences of nuance, if not outright contradiction. Opponents of Salafis do credit them for being straightforward and sincere, unlike their opinion of the Muslim Brotherhood. As they develop political skill, however, it appears Salafis also are learning the unfortunate art of spin. Then effortlessly, unprompted, and without rancor, he slid into a passionless diatribe. “When we reach the stage of our empowerment, we will collect jizia from the Copts. So when Sheikh Abdel Khaleq Mohamed states at an official party function, “Democratic work is unbelief, but as long as it leads to the victory of God’s religion it is permissible to us,” does he represent its official line? Or does party president Ehab Shiha, who clarified the misquote, adding after ‘unbelief’ the words ‘… as a doctrine’ which were clipped in the article? On the contrary, Shiha accepts the definition of democracy as ‘government by the people, of the people, and for the people’ as long as it does not transgress the laws of God. Please click here to read the full article on EgyptSource.